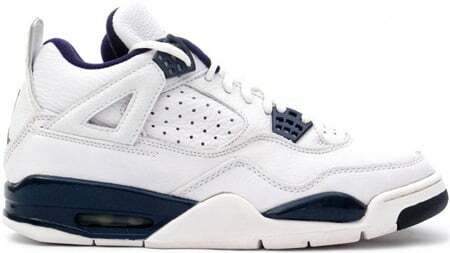 The White and Midnight Navy Air Jordan IV Retro made its debut in Summer 1999. Although it was not designed after any of the original Air Jordan IV’s, the White and Midnight Navy is nothing less than classic and suits the Air Jordan IV very well. The White and Midnight Navy Air Jordan IV Retro is definitely going to remember as one of the nicest Air Jordan Retro, even if the White and Midnight Navy color-way seem too original. The Midnight Navy Air Jordan IV Retro was released in September 1999 and was sold for $100, but it has been almost 10 years since its release which makes it one of the hardest Air Jordan IV Retro’s to come by.